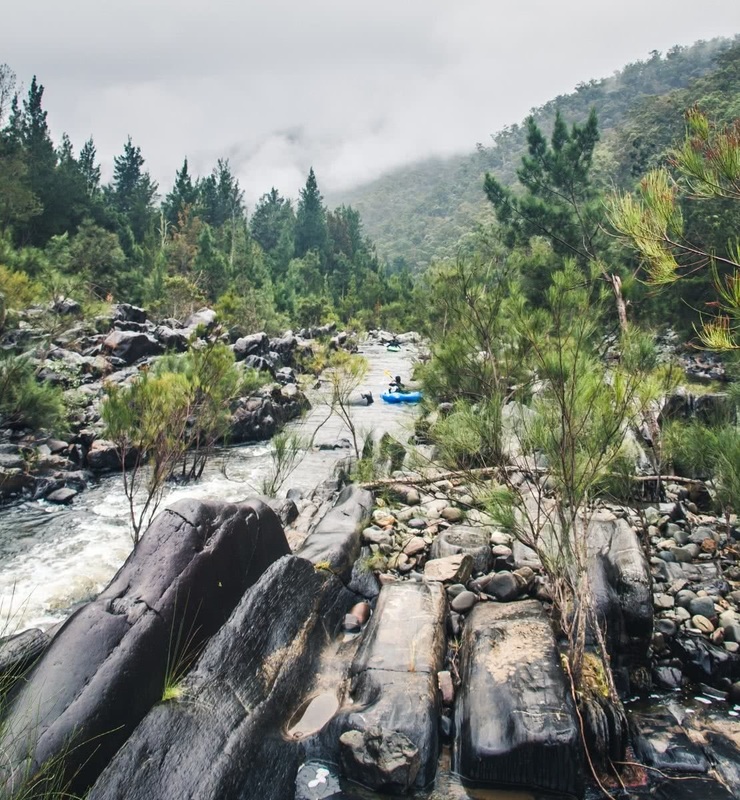 The Shoalhaven River is a tantalising tangle of blue on the map, winding its distracted way through several national parks before exiting to the ocean just above Jervis Bay. 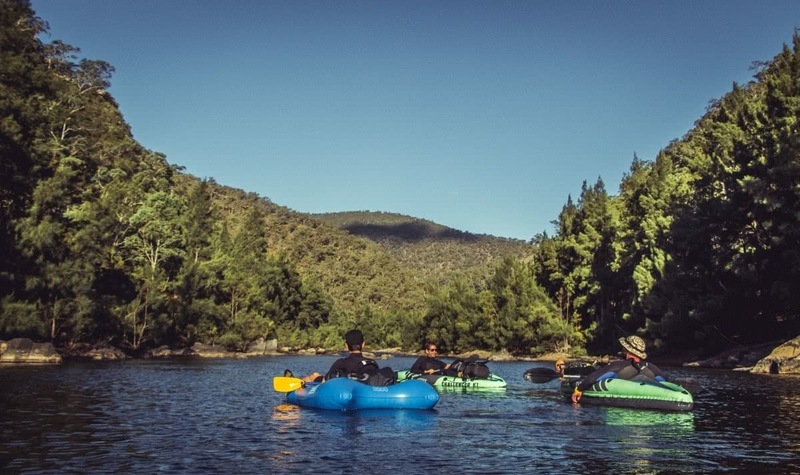 Henry and friends decided that packrafting the Shoalhaven River, along a section in the Morton National Park, sounded like a great idea. They were right. Drooling over topographic maps on a Friday night with a box of beers and a bucket of adventure lust, we couldn’t help but notice the wild expanse of Morton National Park; her arterial water source snaking through it…the mighty Shoalhaven River. We decided to packraft it for 3 days. So we packed, slept and left at 6am the very next morning. 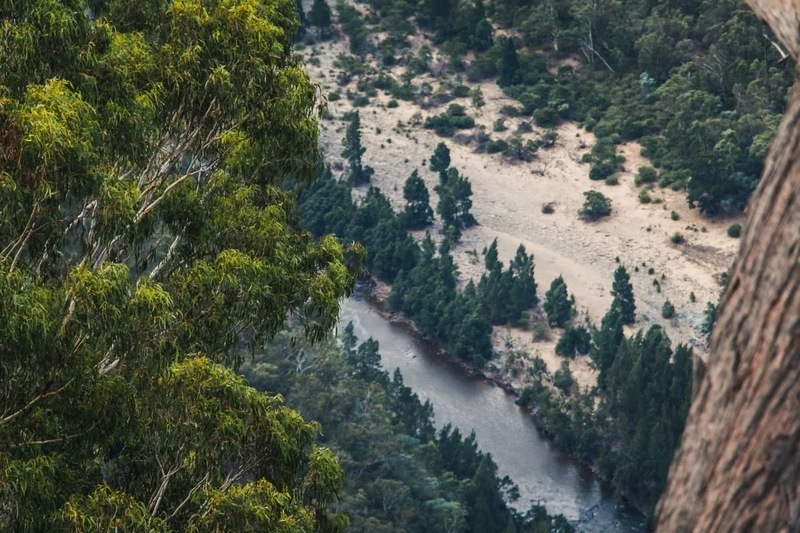 With supplies gathered in Bowral, we dropped a car off at Badgery’s Lookout car park and then continued to Greater Horseshoe Bend to begin the walk down to the river. The final section of this road (15km approx) is best suited to 4WDs as the track surface deteriorates faster than an 80 year old’s hangover, after heavy rainfall. The steep, scrubby and unmarked walk from the car park follows an incredible ridge-line down to the river. The ground isn’t the sturdiest here so take your time and allow 1-2 hours. Once you’ve done this bit, the fun really starts. 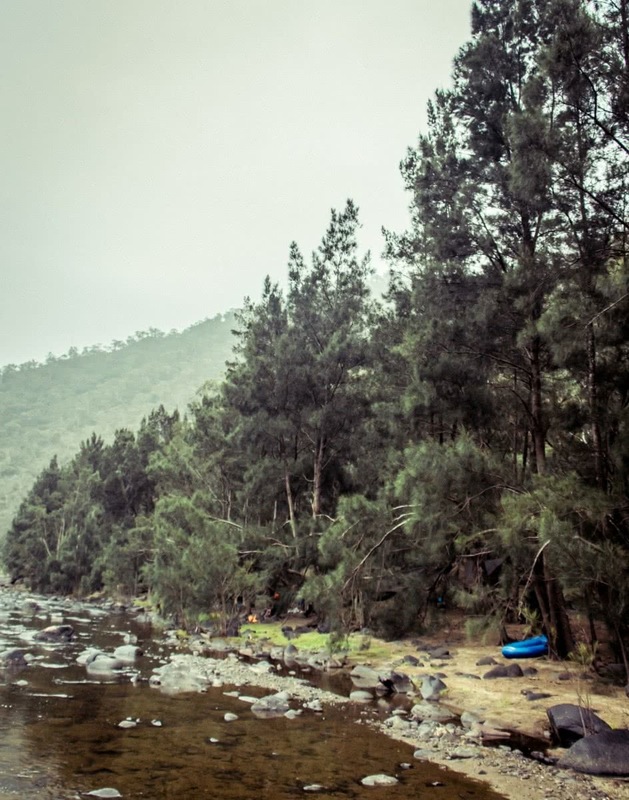 The gnarliness of this adventure is entirely dependent on what time of year you attempt it and of course the water level, which you must check here. As relatively novice pack-rafters (with blow up boats that many pool paddlers would scoff at) the water level of 0.65m suits beginners perfectly. 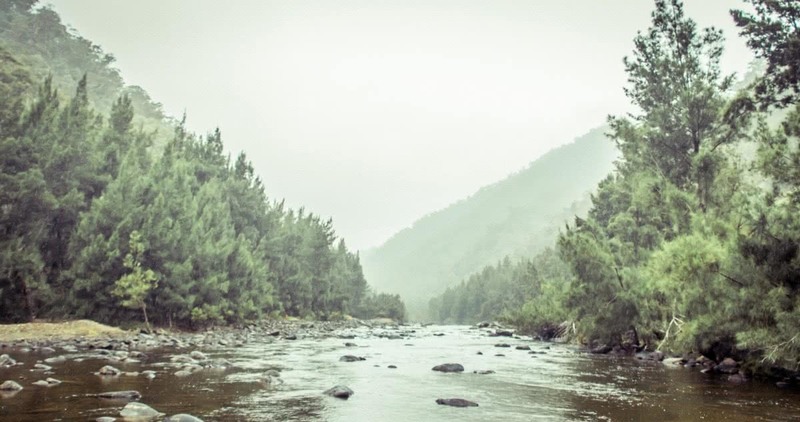 We faced some relatively gentle Grade 1-2 rapids, which would then calm down to slow moving water that nudged us peacefully down an absolutely beautiful river. 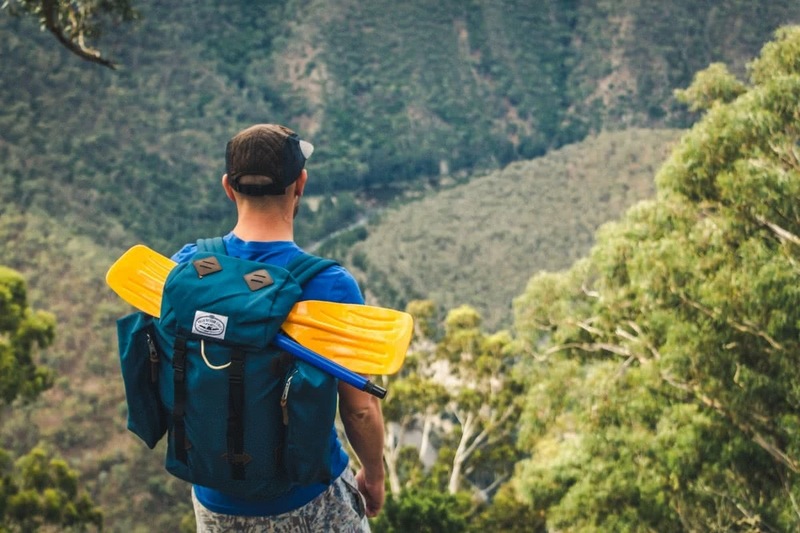 On several occasions the water would become too shallow to paddle, so we’d have to hop out of our dingys and push our boats and bags over smooth, sometimes slippery rocks. This became par for the course on day 2 and 3 of the trip. 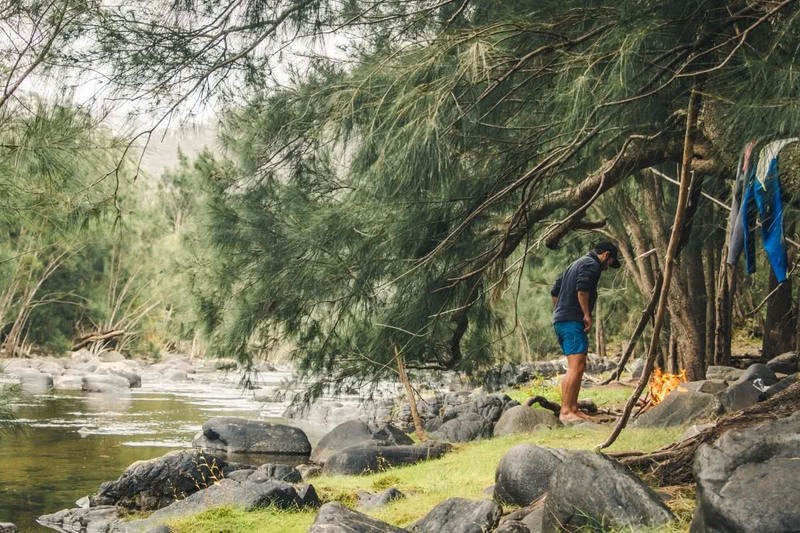 We found an alluring campsite amongst the pine trees that lined the river, slung up our hammocks for the night and enjoyed a few too many whiskeys, which resulted in an impressively acrobatic face-plant when I tried to retire to bed. Day 2 took the biscuit. I’ve never seen a landscape like this in Australia before and I lost count of the number of times we all commented on how it reminded us of Colorado (none of us have ever been to Colorado by the way). Mist rolled over towering gorges to reveal a pearler of an autumn day, the unseasonably warm river was quite literally teeming with fish (which we unsuccessfully tried to catch) and the paddling was nothing short of mind-bending. Like passing through a Tolkien-esque Hobbit landscape, each twist and turn of the river revealed a new mini-adventure for us to tackle. One rapid of note is the ominously named ‘Washing Machine’ – at Grade 3 it certainly posed a threat to our pathetic excuses for vessels, but we made it through. Once through the dramatic cliff-scrapers of Block Up Gorge, we realised we were more than a tad behind schedule. We skedaddled to camp 2 – another alluring pine tree cluster on the bend of the river – and climbed into our hammocks face-plant free at 8pm for an early night at the million star hotel. The rhythm picked up considerably on Day 3! 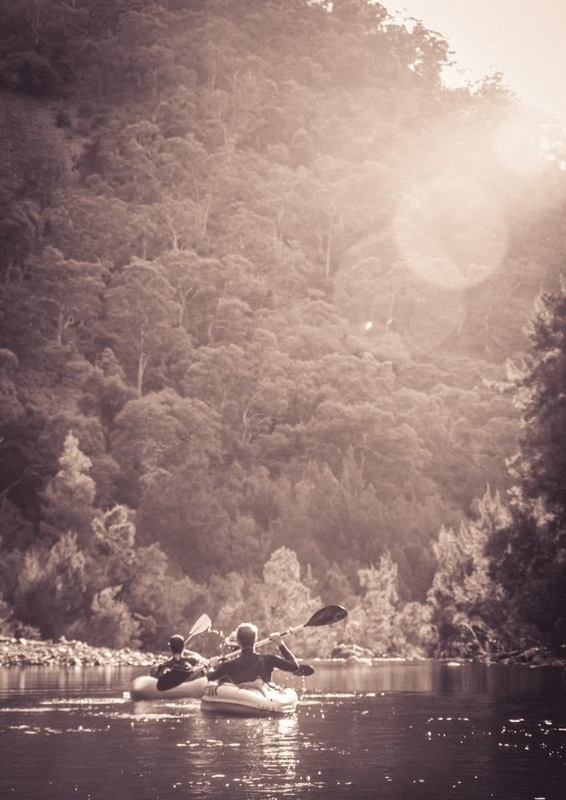 Up at 6.00am sans-hangover we were on the water by 7.30am, paddling resolutely through paradise. Gentle 1 and 2 grade rapids posed no real challenge for our sorry looking dingys, but the scenery we carved through would bring most humans to opt out of civilisation and set up a life there. Eventually reaching Badgery’s Spur, all that was left was a pretty meaty 2 hour walk up to the car park. Make sure leave yourself enough time, light and energy for this beast of a hike out!